All orders can be drop shipped to individual addresses. Email request for address format. Contact us for special request or quantity breaks. Make an impress presentation with this handsome container filled with delicious sweets and treats. 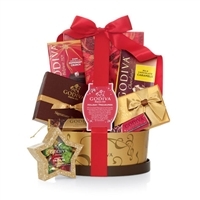 Godiva Holiday Treasure Gift Basket for special people and big events that deserve the best chocolates. 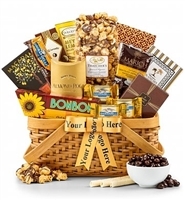 Taverns Golden Celebration Gift Basket with brand name foods and delicious sweet treats. 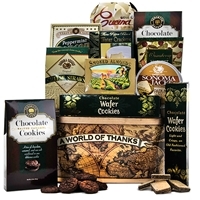 Express your gratitude with this delicious gourmet gift basket of cookies, chocolates and more. 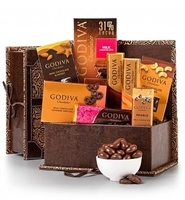 Tavern's decadent Godiva chocolate gift basket. Ultimate Artisan Cheese Gift Basket. Top-of-the-line insulated picnic basket filled with cheeses, meats, crackers and more. Weekend BBQ with family and friends all ready in the Omaha Steak Weekend Combo Kit. Fire up the grill for Omaha Steaks Top Sirloins and Burgers. Our Gourmet Cheese & Fruit Basket is a glorious combination of some of the world’s finest cheeses: and more. 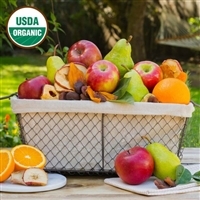 The Simply Organic Fruit Basket features top of the season fruit, organic, elegantly arranged in a sturdy hand woven wicker hamper. 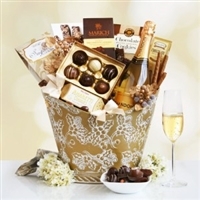 California Chandon sparkling wine and chocolate gourmet gift basket to celebrate any event or thank clients. Our wood wine barrel gift chest is a beautiful addition to any wine lovers collection. 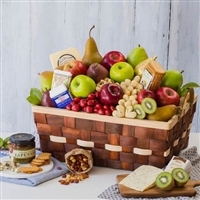 Enjoy the sun in elegance with this very fancy picnic basket sure to impress your friends and family! A Holiday favorite! A wine tasting delivered right to your door. Let's get the part started! 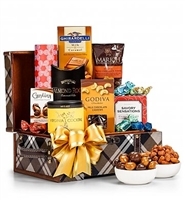 Wine & Chocolate gift basket pairs two of lifes greatest pleasures together into one perfect basket. 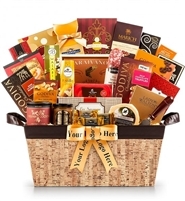 Pinot Grigio Wine Gift Basket is a excellent arrangement of gourmet delicacies accompanied with a bottle of fine wine. View product details for complete description. Wine gift basket pairs both sweet and salty treats with a select bottle of wine. View product details for complete description.. 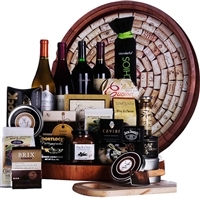 Original Wine Barrel Lazy Susan and Serving Tray Filled with a full-bodied Red Wine and Gourmet Treats. The Godiva Chocolates & Moet Champagne Gift Basket is a beautiful arrangement of the finest chocolates, cookies and premium champagne to toast to good times. View product details for complete description. 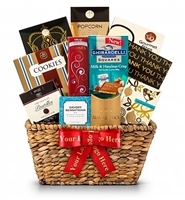 Our decadent Gift Basket features a collection of sweet and savory delicacies. Celebrate any occasion with this ultimate wine, food and gift set. Our signature California Delicious gift box holds wines & gourmet delights hand selected just for you. It’s cool, it’s Californian, it’s classic. Delicious cheese and California wine all in one gift. The World of Thanks! gift basket is a memorable and unique way to say thank you. View product details for complete description.